In a Wilma system, plants grow in pots which are above a tank filled with a nutrient solution. This nutrient solution is pumped through drippers (to feed the plants) and then passes back into the reservoir tank. The beauty of this system is that it can be used with any growing medium (soil, coco, clay pebbles or rockwool) and you can easily control the amount of feed given to your plants with a timer. When compared to hand feeding, the Wilma system provides bigger yields due to the fact that your plants are fed little and often. 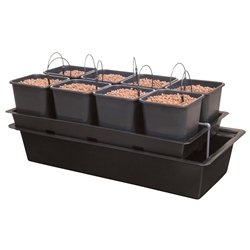 Wilma systems are available in 4, 8, 9 and 10 pot sizes.